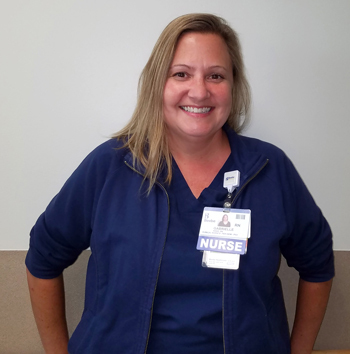 Beebe Healthcare is proud to recognize Gabrielle Wade, RN, as the August Living Our Values Every Day (L.O.V.E.) Letter Award recipient. Gabrielle, a clinical nurse in the Stepdown Unit at the Medical Center in Lewes, was nominated by Rachel Corbin, medical assistant. Rachel observed Gabrielle spending extra time with a patient having withdrawal symptoms and noted how positive and supportive Gabrielle was with the patient. “Gabrielle was firm but kind, and assured [the patient] that we are all human and that we all make mistakes. She is a beautiful soul and a wonderful nurse and I am honored when I am able to work beside her,” wrote Rachel in the nomination. Gabrielle was recognized for building trusting relationships with compassion and kindness, listening carefully and having the courage to communication honestly and effectively, and acting with passion and love for others to make a difference. Jeffrey Fried, FACHE, President & CEO, made the presentation and congratulated Gabrielle. Kerri Watson, RN, Gabrielle’s nurse manager, was also at the presentation to congratulate Gabrielle. 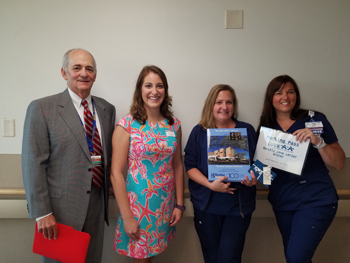 Caption: Shown (left to right) are Jeffrey Fried, President & CEO, Beebe Healthcare; Courtney Hastings, representing the Hertrich Family; Gabrielle Wade, RN; and Kerri Watson, RN, nurse manager. Caption: Gabrielle Wade, RN, was selected as the recipient of the L.O.V.E. Letter Award for August.